Abby Loveys became the first girl to break 18 minutes on the new Greystone course when she ran a blistering course record 17:36 to lead NJ #5 Randolph to the Large School title, and Mendham knocked off NJ #10 Morris Hills in the Large School boys race at Tueday's NJAC Championships. The 17:36 by Loveys obliterated the Greystone course record of 18:02 set last month by Alexa Westley of Warren Hills at the Stewart Memorial meet. Led by Loveys, Randolph went 1-2-7-8-17 and averaged 19:03 on the way to a 35-61 victory over runner-up Mount Olive. In the boys Large School race, Mendham put three runners in front of the first Morris Hills runner to defeat Morris Hills, 51-65. Mendham's went 2-4-7-11-27 and averaged 16:11. Morris Hills averaged 16:27 and had a remarkable 1-5 compression of just 13 seconds. Colin Logsdon of Chatham ran the top boys time of the day by winning the Large School race in 15:36. Jack Stanley of Mendham was second in 15:45. 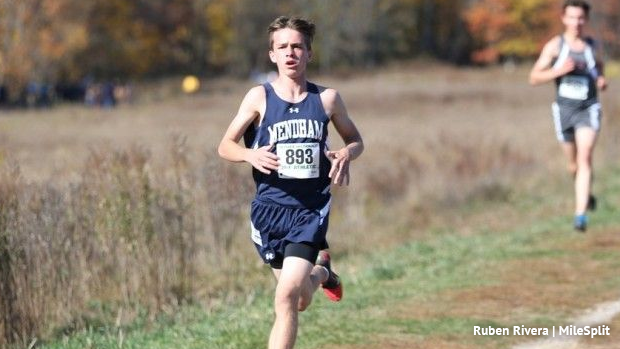 In the Small School races, Morgan Mehmel finished first in 19:01 to lead Villa Walsh to the girls title, and Jared Cooper captured the boys race in 15:53 to spark Mountain Lakes to the boys championship. Villa Walsh went 1-4-6-11-14 and averaged 19:54 to defeat Mountain Lakes, 36-83. The Mountain Lakes boys finished 1-7-8-14-25 and averaged 16:56 to edge Whippany Park, 55-60.